Notes: Cut roughly square and filed to correct weight. I call this set the Prototype because they seem to have arrived on the scene rather suddenly towards the end of the 17th Century. As this was the time when the Worshipful Society of Apothecaries was nearing its period of greatest influence, it is not unreasonable to suppose that the Society was responsible for these and the next few sets up to 1113. It should be remembered that for much of the 18th Century, the Society held the contract to supply medicinals to the Army and to the Admiralty and this would have included scales, weights, bandages and all the other necessary items as well as medications. The earliest of this type had rather archaic depictions of the Apothecary Symbols and were often stamped with a rose-like sign. Professor Biggs states that ‘this mark…may have some connection with the Apothecaries Company’. It is also interesting to note that these weights did not really seem to replace anything very specific but suddenly appeared and their use seems to have become quite widespread very quickly. It also seems that these weights, though the symbols became a little more standardised, were almost the only ones available for the next 100 or so years until the advent of the commercial Scale Companies in the early 19th Century. I treat this set as the earliest of what may be called the standardised sets and think it may date from the 18th Century. 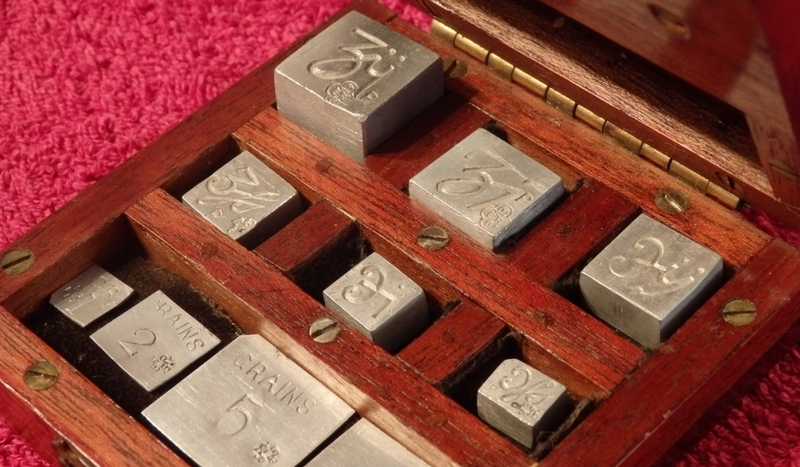 Prof Biggs states that the reverse of the smaller weights may be blank , but as I have a complete set, all with blank reverse, I prefer to treat them as a distinct set , which I have provisionally numbered 1110 A – pending classification by Prof Biggs. Similar to Set No.1110 but stamped on one side only. Notes: This set is not listed by Biggs although I have two weights (1 & 2 Drams) of this description. I have numbered it set 1111A pending Professor Biggs’ decision. Notes: This set is not listed by Biggs although I have four weights (½ & 1 Scruple and ½ & 2 Drams) of this description. I have numbered it set 1111B pending Professor Biggs’ decision. Notes: The Scruple Weights of Set 1111 and Set 1112 would be identical. Cut roughly square and filed to correct weights. Notes: Cut roughly square and filed to correct weights. Probably World War 2 or Post War Austerity Issue. Notes: Biggs states that these were probably made by Day & Millward. Front: Made in Shape of Numeral with name of Unit stamped on. Notes: Patented in 1903 by P. Edwards. Front: A Crown surrounded by lettering “REGISTER MARCH16 1847” & this surrounded by “APOTHECARIES WEIGHT * W & T A”. Notes: Crown is omitted on Half & One Scruple Weights. Front: Apothecary Symbol in Centre with Unit in Words curved above and “W & T A” below. Reverse: Apothecary Symbol in Centre with Unit in Words curved above and “W & T A” below. Notes: Set 1240, manufactured by J.L.B., and Set 1222, made by Hodgson & Stead are copies of this set. Set 1221 was advertised in Avery’s 1894 Catalogue. Front: Apothecary Symbol in Centre with Unit in Words curved above and “H & S” below. Reverse: Apothecary Symbol in Centre with Unit in Words curved above and “H & S” below. Notes: This is a copy of Avery’s Type 1221 but made by Hodgson & Stead which was taken over by Avery in 1913. Briggs suggests that this set should probably be dated around the time of the take-over. Front: A Crown in Centre with “STANDARD” curved around above and a line ornament below. Reverse: Apothecary Symbol in Centre with Number in words curved above and denomination in words curved below. Notes: Maker is unknown. Set is rare. Front: “STANDARD” curved around above a line ornament with “P.ROGERS & CO.” below. Reverse: Apothecary Symbol in Centre inside a circle with Number in words curved above and Unit in words curved below. With a beaded border. Notes: Set 1224 & Set 1225 differ only in the spelling of ‘Dram’ and ‘Drachm’. The scruple weights are identical in both sets. The 2 Dram Weight lacks the inner Circle. Notes: The 2 Drachm Weight lacks the inner Circle. Set 1224 & Set 1225 differ only in the spelling of ‘Dram’ and ‘Drachm’. The scruple weights are identical in both sets. Front: “P. ROGERS” curved around above and “BIRMINGHAM” curved around below with “& CO.” and a line ornament in the centre. Reverse: Apothecary Symbol in Centre inside a circle with Number in words curved above and Unit in words curved below. Front: A CROWN in centre within a circle, surrounded by “APOTHECARIES WEIGHT”. With a beaded edge. Reverse: Apothecary Symbol in Centre within a circle with Number and Unit in words curved around top, and one or more * (stars) curved below. Front: A CROWN in centre within a circle, surrounded by “APOTHECARIES WEIGHT”. Notes: Set 1227 & Set 1228 differ only in the spelling of ‘Dram’ and ‘Drachm’. The scruple weights are identical in both sets. Front: Apothecary Symbol in Centre within a circle with Numeral and Unit in words curved around top, and one or more * (stars) curved below. With a beaded border. Reverse: Apothecary Symbol in Centre within a circle with Numeral and Unit in words curved around top, and one or more * (stars) curved below. With a beaded border. Notes: Both sides are similar to the reverse of Set 1228. Front: Apothecary Symbol in Centre within a circle with Numeral and Unit in words curved around top, with “J.L.B.” below. With a beaded border. Reverse: Apothecary Symbol in Centre within a circle with Numeral and Unit in words curved around top, with “J.L.B.” below. With a beaded border. Notes: A copy of Avery’s set 1221. Quite common and seems to have been used in Household Medicine Kits. Manufacturer is unknown. This set is unusual in that 4 Drachm and 1 Ounze weights are sometimes seen. Note the unusual spelling of ‘Ounze’. They are often rather poorly made. Notes: Similar to Set 1240 but made of Iron with a silver plating which has usually degenerated to a greater or less extent to a greyish coating. If in doubt check with a magnet though I have several weights which are not magnetic but seem to be silver coated. Those sets that are silver plated are usually better finished off than the brass ones of set 1240. Front: Lion standing on a Crown in Centre with Registration Symbols on either side. “STANDARD” curved around top with “W.& T.A.” below. Reverse: Apothecary Symbol in centre with Number above and Unit below – both in words. Notes: Half Dram has no Lion. One Scruple has neither Lion nor Crown and only one Registration Mark. Half Dram is also found as One & Half Scruples. All in a beaded border. Same as Set 1250 but with the Registration Diamonds stamped on rather than die-struck. Front: Lion standing on a Crown in Centre with Roses on either side. “STANDARD” curved around top with “J.B.B.” below. All in a beaded border. Same as Set 1250 but with the Diamond Registration Symbols replaced by Roses. Reverse: Apothecary Symbol in centre with Number above and Unit below – both in words. All in a beaded border. Same as Set 1250 except that name of unit is curved below the Apothecary Symbol. Notes: Manufacturer unknown. Very scarce – perhaps because they infringed Avery’s patent and were withdrawn. The 2 scruple weight (illustrated), I noticed in an assortment of weights being sold with a scale on eBay – my most recent acquisition. Front: “STANDARD” with a simple line decoration above and below. All in a beaded border. Notes: Manufacturer unknown but one wonders if JBB replaced Set 1253 with this set. Front: “LIMITED” across the middle with “W.& T.AVERY” curved above and “BIRMINGHAM” curved below. All in a beaded border. Reverse: Apothecary Symbol in centre with Number above and Unit below – both in words. All in a beaded border. Notes: Avery became a Limited Company in 1895 which helps date this set. Front: Numeral in Centre with “W & T AVERY” above & Unit in words below. Reverse: Apothecary Symbol in centre with “W & T AVERY” above. Front: Numeral in Centre with “W & T AVERY LD” above & Unit in words below. Reverse: Numeral in Centre with “W & T AVERY LD” above & “GRAINS” below. Notes: There is no LD” on front of smaller weights and whole name is omitted on reverse. No beaded borders. Front: Numeral in Centre with “W & T AVERY LD” above & “GRAINS” below. Notes: There is no LD” on front of smaller weights and whole name is omitted on reverse. No beaded borders. Professor Biggs does not list this as an Apothecaries set, but as the denominations are the same as a scruple and drachm set, I think they should be listed as apothecaries weights . If they were a pennyweight set they would be 24, 48, 72, 96 and 120 grains respectively. Notes: Prof Biggs does not list this set as an apothecary weight but as a pennyweight set (1, 2, 3, 4, 5 pennyweights) would be 24, 48, 72, 96, 120 grains respectively. Notes: Made from finished flans with rounded edges. Front: Numeral above the Unit in words curved below. All in a field with a raised border. Reverse: Apothecary Symbol in a field with a raised border. Notes: My boxed set is labelled “H.M.Stanley Ltd., Burgess Hill, Sussex”. Made from finished flans with rounded edges. Front: Numeral above “GRAINS” curved below. Notes: Made from rough-cut unfinished flans. Front: Apothecary Symbol stamped on. Reverse: Apothecary Symbol stamped on. Notes: Biggs states that they are often seen with London verification marks from the 1920’s. My set was a kind gift from Tom Wood. Front: Stamped with a number of dots or Annulets to indicate the number of Grains. Notes: Professor Biggs states that these have been found with the marks of James I and Charles II which would date them between 1603 – 1625 (James) and 1625-1649 (Charles). NB: Crowned “I” is James because there is no J in Latin. Front: Based on the geometrical shapes used for wire weights. See Set 2690. The number of segments equals the number of grains. FIGURATIVE Cut out of thin Aluminium Sheet. Late 19th Century. Var: “GRS” Stamped on thin sheet Brass. Var: “GRAINS” Stamped on thin sheet Brass. Notes: There are many varieties.The smaller Weights are sometimes abbreviated to GR or GRS.